More than 6,000 fifth grade students (two groups of 3,100 students each) from throughout Los Angeles County immersed themselves in the performing arts at the 47th Annual Blue Ribbon Children’s Festival last week, February 28. The three-day event will welcome more than 18,000 students and continues on March 1 and March 2, 2017. The event culminated in a synchronized dance on The Music Center Plaza. Upon arrival, students attended a free performance by Ailey II, the celebrated second company of Alvin Ailey American Dance Theater in The Music Center’s iconic Dorothy Chandler Pavilion. Following the performance and an alfresco rehearsal on the Plaza, students performed a dance inspired by the Rocka My Soul finale section of Alvin Ailey masterpiece Revelations. For many children, The Blue Ribbon Children’s Festival marks their first opportunity to experience a live performing arts event. 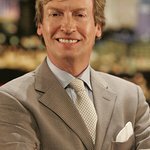 Multi-award winning producer, performer and co-creator of So You Think You Can Dance and executive producer of American Idol, Nigel Lythgoe, who is also a member of the Music Center’s Board of Directors and who was recently awarded an OBE (Order of the British Empire), along with Chairman of the Los Angeles County Board of Supervisors, Mark Ridley-Thomas, were on hand to offer special words of encouragement to the students who had spent weeks prepping for their dance routine on the Plaza. As California’s longest continuing free arts education initiative, The Blue Ribbon Children’s Festival is presented by The Blue Ribbon, the premier women’s support organization of The Music Center. Founded by Dorothy Chandler in 1968, The Blue Ribbon is committed to giving students access to the best of the performing arts from a young age. Since its inception in 1970, The Blue Ribbon Children’s Festival has introduced more than 860,000 young L.A. students to the power and inspiration of the performing arts. More than 125 Blue Ribbon members volunteer over the three-day period to keep the Festival running smoothly. Countywide, fifth-grade classes from 252 participating schools receive advance standards-based curriculum materials, background on the guest artists and classroom activities designed to prepare students for the performance they will be viewing. Inspired by Revelations, The Music Center’s Tara Cook Davis and Susan Cambigue-Tracey created choreography just for the students and distributed it to the teachers for advance instruction. Students also learn about audience etiquette, what to watch for during the performance, dance history and terminology. This year, students explored the evolution of the spiritual, including its earliest roots in slavery and its inspiration of various art forms—Jazz, Blues, modern rock, classical, the American musical and dance. Alvin Ailey grew up in the rural American South, and the musical influences of his early life there shaped many of his most memorable works, including the acclaimed Revelations that debuted in 1960 and is now a signature piece in the Ailey repertory. Founded in 1974 by the late internationally renowned choreographer Alvin Ailey, Ailey II is universally renowned for merging the spirit and energy of the country’s best young dance talent with the passion and creative vision of today’s most outstanding emerging choreographers. Ailey was a pioneer of programs promoting arts in education, particularly those that benefited underserved communities. Throughout his lifetime, he was awarded numerous distinctions, including the Kennedy Center Honor in 1988 and, posthumously, the Presidential Medal of Freedom in 2014. Following their performance, each student received a keepsake book, A Journey through The Music Center, made possible by a generous gift from Blue Ribbon member, Maxine Dunitz. Describing The Music Center’s four theaters and various aspects of live performance, the book is updated and reprinted annually for distribution at The Blue Ribbon Children’s Festival. Over the years, students attending the Festival have seen performances by the LA Phil, the LA Opera, American Ballet Theatre, The Joffrey Ballet and Diavolo Dance Theater, among others. At the 2015 Festival, participating students set the GUINNESS WORLD RECORDS title for the Largest ribbon dance for the greatest number of people simultaneously performing the same choreographed dance using handheld sticks with attached ribbons at a single venue.